How easy is it to set up a new Membrane Keypad or Keyboard? 1. Plug a good membrane, keypad, keyboard into the "Darren" and click "Learn". "Darren" will find all common "Short" connections and any LED's then display the results on screen. 2. 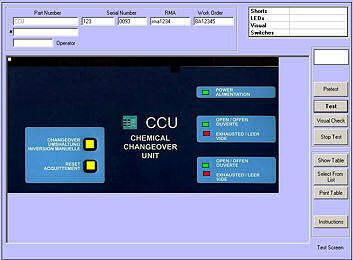 Now push all the buttons / key switches, results will be added to the on screen table. Adjust the resistance values if necessary to the thresholds in your product specification. 3. Copy a picture of your product on to the computer. A jpeg, GIF or bmp will be fine, your drawing package should be able to produce this. 4. Select the "Visual" screen and click the mouse on the picture to tell the system where all the buttons and LED's are on the screen (using different Shapes, Colours and Sizes). 5. Type in any instructions that you want the operator to read before testing. 6. Type in the part number and click save. It will only take a few minutes to set up a new product, and you only have to do it once. 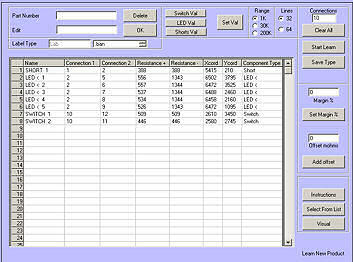 This is the setup screen showing switches, LED's and resistances. Setting up the switches and LED's couldn't be easier! How easy is it to test a Panel? 1. Select the product (Membrane keypad, keyboard) to be tested. A picture of the keypad will appear on the screen. 3. All the LED's will be illuminated, check that the colours are as shown on the screen. Push the footswitch to indicate that they are correct. 4. Push all the keypad switches in any order. Darren will check the resistances against the thresholds and then make a sound to indicate the result of all the tests. Any problems will be shown on the screen. 5. TEST COMPLETE. Unplug the keypad and repeat from item 2 for the next keypad. Why does Darren use a footswitch and make sounds? So that you can keep your hands and eyes on the panel you are testing. You only need to look at the screen if there is a fault as the sound tells you where you are in a test and what the result is. We have been making test equipment for over 20 years, we know that every time you use a keyboard or look up at a screen you are taking your hands and eyes off the job in hand. The Darren will comfortably test between 500 and 1000 average panels in a day. This means that every key pressed or switch turned will be multiplied by 1000, all the extra operations soon mount up. It takes time and it also puts a strain on the operator if they are stretching across to switches and keyboards during every test. Can Darren provide full test documentation? Darren will print a sheet for each membrane switch keypad, keyboard if required, this gives the resistance of every switch, the batch, serial and part number, time, date of test and test operator.. The results of all tests are stored in an Access database so you archive all tests, you could copy these onto a CD and send it to your customer if required. 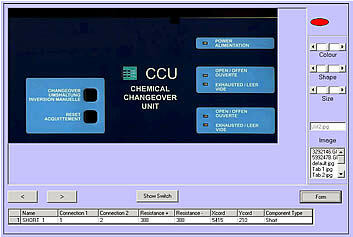 The database will store all test results including the resistance of every switch tested, this will allow you to plot changes in resistance and produce reports on product quality. Product marked (5-Year GT) have a 5 Year Banair Guarantee. Click here for more details.